So I took a day off and so did my best friend who deserves a million Thank Yous for being such a great friend, investing her freetime and being such a good help in the kitchen. To bake for over 40 people is very challenging in many ways. Not only the number of guests should guide your thoughts but also day and time play an important role. You never know if the people like more sweet or more salty stuff, whatever you do it’s going to be wrong any way… So don’t panic and make wise choices. Everyone has all-time favourites and standard recipes, stick to those and don’t experiment on such days. We baked more than half a day in order to finish up everything but it was totally worth it and we had a blast. In the end, the Quiches were gone in almost no time, the Donau waves were a fast seller and half of the brownies and muffins were left over. Luckily I have some colleagues that had to work late anyway and were very happy about the left overs. Donau waves are a German cake classic and my Mum’s recipe earns a lot of compliments every time, because it is simply the best! The base is a vanilla cream cake, topped with chocolate cake, poked with cherries. 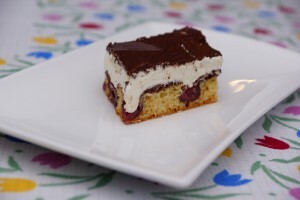 On top comes a whipped vanilla buttercream and a dark chocolate glace with a wave-like pattern. The buttercream gives this classic tray bake a decadent touch, but a cake table without Donau-waves is simply unthinkable. Preheat the oven to 160° C (with fan). Drain the cherries and line a baking tray with parchment paper. Soften the butter, then add the sugar and vanilla sugar and mix until creamy. Mix flour, salt and baking powder and sift it in. Stir it by hand and don’t overmix. Spread half of the dough onto the baking tray. Sift the cocoa powder into the rest of the dough and mix it, add the tbsp milk if neccessary. Spread the dark dough over the blond dough evenly. Scatter the cherries over and press them in lightly. Transfer to the hot oven and bake for 35 minutes, until a skewer comes out clean. Let it cool completely. Place all ingredients in a bowl and mix due to instructions on the packaging. Edit: Don’t follow stupid Dr. Oetker, I did last night and it ended bad – small butter pieces in my butter cream that wouldn’t go away! And then I realized that I always do it like that: Soften the butter, then add the milk slowly while mixing and the cake cream powder afterwards. When everything is blended, mix on high speed for 2 minutes. Then spread over the cooled cake. Melt the chocolate with the coconut oil and mix unitl smooth. Let it cool until lukewarm and spread over the butter cream. Some take a fork and make a wavelike pattern on top. When cutting the cake use a hot knive, otherwise the top will crackle and fall into pieces. I’ve been inspired for this Valentines Treat by Man of Aran Fugde who recently posted heart shaped fudge on their facebook page. I’ve been dying to make some Fudge on my own but been put off by all the hassle with tempering the sugar, complicated recipes and the confectioner in a TV show who talked about the million things that can go wrong. Once again The Bakery Edition of Lecker Magazine had the answer. I found this very easy recipe from a blogger that was featured in the magazine: Peanutbutter Fudge by Zucker Zimt und Liebe. Last weekend I took my first Cupcake Class at Genussakademie in Frankfurt. It was held by Ewa Feix who is a professional Cupcake Konditor and sells gorgeous Cupcakes in Frankfurt. My friend sent me the link to the booking some weeks ago and asked me if I want to go. Hell yeah, why not? Especially when it comes to Cupcakes I think I can still learn a lot! Decorating Cupcakes is an art itself and you know all these little bits and pieces of professional advice enhance your skills over time. So I booked the class and went there with my friend who discovered her love to baking just recently (I hope it was my good influence *hehe*).